Background: Percutaneous coronary intervention (PCI) for chronic total occlusion (CTO) of the left anterior descending (LAD) specifically is associated with improved long-term 5 year survival as compared to PCI failure.The procedure is associated with usage of different types of dedicated guidewires by simple or complex techniques aiming to reopen the occluded artery. Aim: To describe types and outcome of guidewires used in LAD-CTO utilizing a first intentional single wiring simple strategy. Methods: A single center prospective registry for all consecutive patients with a PCI attempt to a native LAD CTO. The initial strategy for lesion crossing was Single wiring. Results: A total of 30 patients with LAD CTO lesions (100%), were recorded. Mean age was 71.6 + 15 years, 77% were Males, risk factors Hypertension in 63%, Diabetes 27%, Dyslipidemia 57%, smoking 40%, hereditary in 13% of patients. Isolated guidewire (GW) success rate was very high 93%. 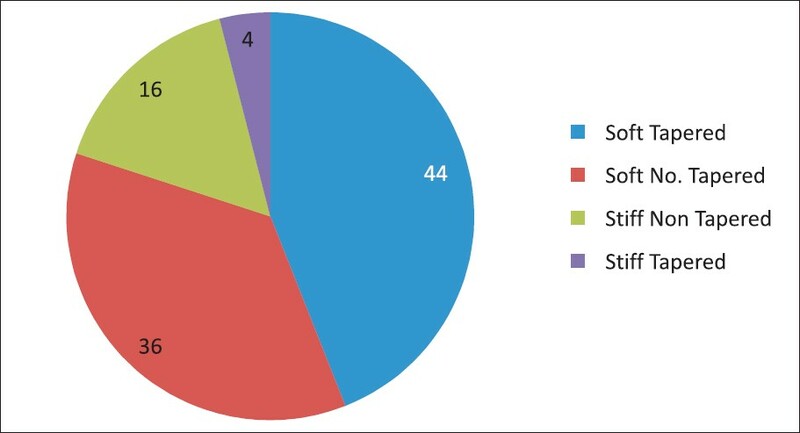 Single wiring was the prevailing technique used in 97% of successfull lesions (83% of total cases) while only 3% were by multiple wiring techniques. Successful single antegrade wiring represented 63% with a GW success rate of 92% of cases. Successful single retrograde wiring represented 13% with a GW success rate of 67%. Successful Crossing GW types in our patients were 44% Soft Tapered GWs; fielder XT (44%), 36% were Soft Non Tapered Pilot 50 (28%), whisper (8%), while 16% were Stiff Non tapered GWs; Miracle 12 (8%), Miracle 6 (4%), Miracle 3 (4%), and 4% were Stiff Tapered GWs; Progress 200 (4%). Conclusions: Single wiring as an initial strategy in PCI for LAD-CTO lesions has a high success rate and is associated with a 44% majority of Soft Tapered GWs, 36% Soft Non Tapered, 16% Stiff Non tapered GWs, and 4% Stiff Tapered GWs. CTO is generally a stable lesion, in which a thrombus has progressed, commonly with the thrombus extending to a nearby side branch ostium. , The intimal plaque is located between the true lumen and subintima, and is more resistant than the subintimal tissue. The longer the duration the harder the intimal plaque, with denser calcium deposits. When a fresh thrombus is formed after vessel occlusion, it is gradually transformed into an organized thrombus with dense collagenous fibro-calcific tissues at the proximal and distal ends, referred to as proximal and distal fibrous 'caps'. The proximal fibrous cap is more rigid and at a higher risk of subintimal guidewire (GW) migration than the distal fibrous cap, which is weaker and less rigid  (providing the rationale of being the entry point for retrograde approaches). Microchannels with lumen sizes approximately 200 um are present inside the CTO lesion, extending toward small side branches or vasa vasorum or continue longitudinally from the proximal to the distal lumen reaching up to 85% of the CTO length. They may become fewer as the CTO matures,  or continuously exist in loose tissue from the proximal to the distal fibrous caps, without relation to the CTO age,  offering an explanation for successful loose tissue tracking even in very old CTOs. The subintimal space 'media' is located between the intima and the adventitia, near the external elastic lamina. It consists of weak connective tissue that may show an intramural hematoma, with a dissection that can easily expand widely in both longitudinal and transverse directions. Percutaneous coronary intervention for CTO of the left anterior descending (LAD) specifically, is associated with an improved, long-term, 5 year survival, as compared to PCI failure. The procedure is associated with usage of many different types of dedicated guidewires in the process, aiming to recanalize the occluded vessel. Crossing the occlusive lesion till it reaches the true lumen may be achieved by GW tracking, through the lesion's intima or subintima. According to the GW type, a 'Soft Approach' is crossing with a soft hydrophilic GW, for example, a tapered fielder XT, while a 'Stiff approach' is crossing with a stiff non-hydrophilic GW, for example, Miracle. The 'Combo technique' is penetrating the resistant cap with a stiff GW and crossing the less resistant portion with a soft GW. To describe the different types and outcome of soft and stiff, tapered and non-tapered guidewires used in crossing CTO of the native LAD artery, utilizing a first intentional single wiring strategy. The study was a single center prospective registry. All consecutive patients with a PCI attempt to a native LAD-CTO from January to December, 2010 were registered. All patients showed evidence of myocardial viability in the LAD territory. All other coexisting non-LAD coronary lesions indicated for interventional therapy were treated before attempting the CTO procedure (30% of the cases within the same session). All cases were first attempts, with no previous attempt failure recorded of the specific CTO-LAD vessel. All patients had been pretreated and maintained on optimal medical treatment, including dual antiplatelet therapy, and were able to continue on an antiplatelet agent regimen consisting of aspirin indefinitely and clopidogrel or prasugrel daily, for at least six months after the procedure. The operator's initial strategy was to start with a radial access as the first choice whenever feasible, if not, a femoral access was chosen. Bilateral access was carried out whenever it was possible to better visualize the distal true lumen through the collaterals. Six French size sheathes and catheters were preferred whenever feasible. The decision to perform an antegrade or a retrograde approach was left to the operator's discretion and was dependent on each individual patient's condition. The initial strategy for lesion crossing in either the antegrade or retrograde approach was Single wiring by lesion crossing, using only one guidewire (GW) as a simple technique. Multiple wiring by lesion crossing using multiple GWs, as a complex technique, was chosen when single wiring was not feasible. Lesion success was defined as a final percentage of diameter stenosis <50% with a TIMI 3 flow, guidewire (GW) crossing success was defined as the ability of the GW to cross the occlusion and reach the distal true lumen. Guidewires were classified according to the tip into, soft, stiff, tapered, or non-tapered GWs. Continuous variables were presented as mean ± SD or median and range if appropriate. Discrete variables were expressed as counts and percentages. All statistical analyses were performed with JMP version 8.0 (SAS Institute, Cary, North Carolina). The authors had full access to and took full responsibility for the integrity of the data. Between January 2010 and December 2010, a total of 30 patients with 30 LAD-CTO lesions (100%), were recorded. Mean age was 71.6 ± 15 years (37% were >80 years old), 77% were males, and 23% females. Cardiovascular risk factors: HTA 63%, Diabetes 27% (Insulin dependent 14%), Dyslipidemia 57%, smoking 40%, hereditary 13%. 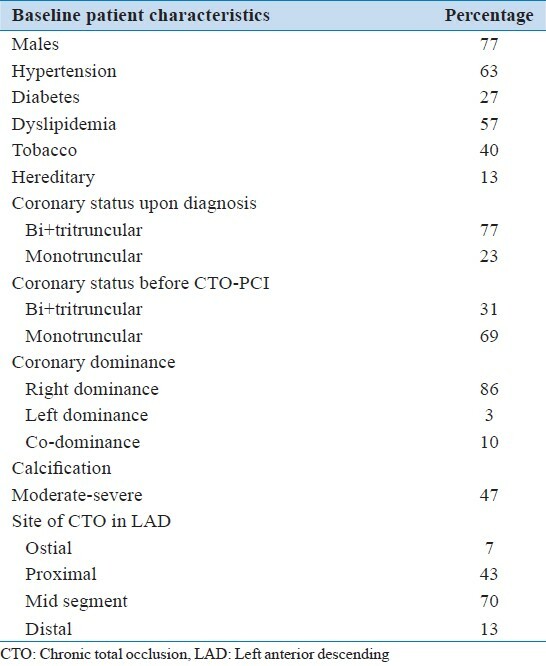 Upon initial diagnosis of the LAD-CTO the majority of patients, 77%, had Multivessel coronary disease, while only 23% had Single vessel disease (CTO-LAD). Coronary artery Dominance was Right in 86%, Left 3%, and Co-dominance in 10% of the patients. The Length of the occlusive lesion was <30 mm in 53% and >30 mm in 47% of the patients. Visible collaterals were evident. 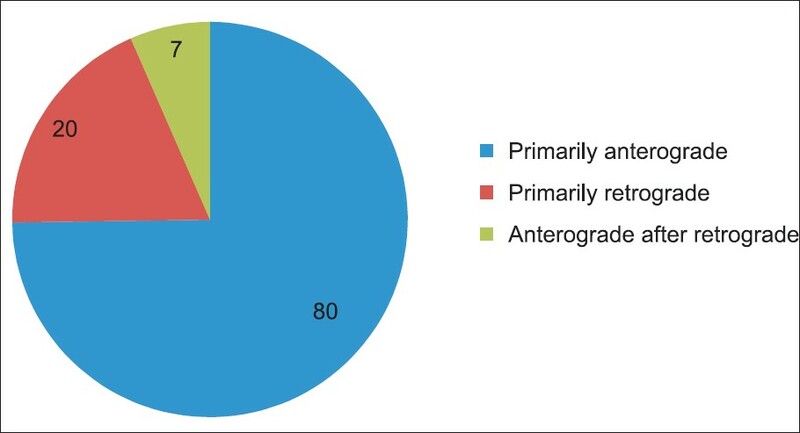 They were antegrade in 58%, retrograde in 62%, both anterograde and retrograde in 31%, and absent or nonvisible in 7% of the patients. Calcification was moderate in 30% and severe in 17% of the patients. Origin was de novo in 97% and in-stent in 3% of the patients. Site of lesion was ostial in 7%, proximal in 43%, middle in 70%, and distal in 13% of the patients. Reference Artery Diameter mean was 2.99 ± 0.33 mm, median 3, range 2.5 to 3.5 mm. Bifurcation lesion CTO-diagonal (>1.5 mm) was present in 20% of the patients [Table 1]. An Initial Antegrade approach was attempted in 80% of the cases while an Initial Retrograde approach was attempted in 20% of the cases. Conversion to an antegrade technique after a failed retrograde attempt occurred in 7% of the cases, bringing the total antegrade approach attempts to 87%, while no conversion was done to the retrograde approaches after any failed antegrade attempt (0%) [Figure 1]. In the antegrade approaches, 97% of the lesions were attempted with single wiring and 3% with multiple wiring techniques. The retrograde approaches were all carried out using the retrograde single wire crossing technique (100%), through visible septal collaterals (100%), without attempts through epicardial collaterals (0%). The successful cases were finalized with antegrade stenting (83%). Kissing with provisional T stenting was done in 67% for bifurcational diagonal side branch CTOs, while in 33% of the cases there was stenting without kissing. Anchoring in a side branch septal or diagonal to facilitate stent delivery was done in 6% of the patients. Rotablateur 3%, IVUS 3%, and Tornus 3% were used to facilitate the procedure with success; all were with anterograde approaches. The Number of GWs used in the Total number of patients were 86 (100%), mean 3.2 ± 2.4, median 2, and range 1 to 9 GW/patient. In Antegrade cases, they were 49 (57%), mean 2.3 ± 1.6, median 2, and range 1 to 7 GW/patient. In Retrograde cases they were 37 (43%), mean 6.1 ± 2.4, median 6, and range 2 to 9 GW/patient were used. Fourteen different types of GWs were recorded in the study. Soft hydrophilic tapered GWs in the Total patients were 28%; fielder XT (27%), and Run-through tapered (1%). In the Antegrade cases they were 26%; fielder XT (24%), and Run-through tapered (2%). In the Retrograde cases they were 30%; fielder XT (30%). Soft hydrophilic non-tapered GWs in the Total patients were 24%; Pilot 50 (17%), and whisper (7%). In the Antegrade cases they were 30%; Pilot 50 (22%), and whisper (8%). In the Retrograde cases they were 15%; Pilot 50 (9%), and whisper (6%). Stiff non-tapered tip GWs in the Total patients were 17%; Miracle 6 (7%), Miracle 12 (6%), and Miracle 3 (4%). In the Antegrade cases they were 12% Miracle 6 (8%) and Miracle 12 (4%). 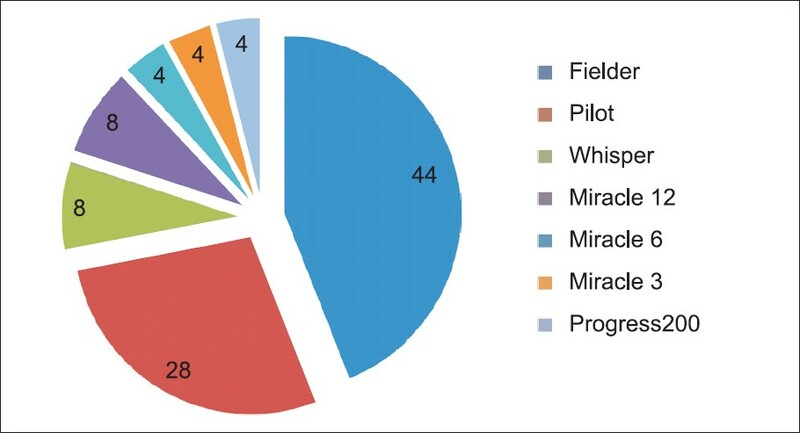 In the Retrograde cases they were 24%; Miracle 6 (6%), Miracle 12 (9%), and Miracle 3 (9%). Stiff-tapered tip GWs in the Total patients were 3%, Confianza pro12 (1%), Progress 40 (1%), and Progress 200 (1%). In the Antegrade cases they were 6%, Confianza pro12 (2%), Progress 40 (2%), and Progress 200 (2%). In the Retrograde cases they were not recorded (0%). 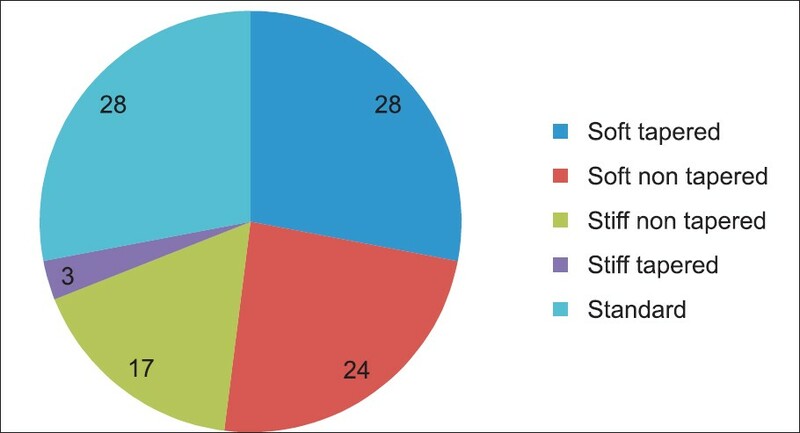 Standard GWs used to complete the PCI procedure after successful wire crossing in the Total patients were 28%, BMW (13%), Choice intermediate (10%), Rotawire (4%), and Revolution Volcano (1%). In the Antegrade cases they were 26%; BMW (14%), Choice intermediate (8%), Rotawire (2%), and Revolution Volcano (2%). In the Retrograde cases they were 30%; BMW (12%), Choice intermediate (12%), and Rotawire (6%). In the Total patients: Successful GW crossing occurred in 93% of the cases, 44% were Soft Tapered GWs; fielder XT (44%), 36% were Soft Non-tapered Pilot 50 (28%), and whisper (8%), while 16% were Stiff Non-tapered GWs, Miracle 12 (8%), Miracle 6 (4%), Miracle 3 (4%), and 4% were Stiff-tapered GWs, and Progress 200 (4%). In the Antegrade approach successful GW crossing occurred in 92% of the cases; 38% of the successful crossing was by Soft-tapered GWs; fielder XT (38%), 42% were Soft Non-tapered GWs; Pilot 50 (32%), and whisper (10%), while 15% were Stiff Non-tapered GWs, Miracle 12 (10%), Miracle 6 (5%), 5% were Stiff-tapered GWs, and Progress 200 (5%). In the Retrograde Approach successful GW crossing occurred in 67% of the cases; 75% of the successful crossing was by Soft-tapered GWs namely the fielder XT (75%), while 25% were Stiff Non-tapered GWs namely Miracle 6 (25%). Overall Lesion Success (final diameter stenosis <50% with TIMI3 flow) occurred in 83% of the Total cases (79% in primary intention Antegrade and 67% in primary intention Retrograde approaches, respectively). A switching conversion to an Antegrade technique after a failed Retrograde attempt occurred in 7% of the cases adding to the success of the overall Antegrade approaches, which became 81%, while no Retrograde approach conversion was done after failed Antegrade attempts, leaving the overall Retrograde approaches at 67%. Successful Antegrade single wiring represented 63% of the total patients. The number of cases is small and from a single center. The results of this study may be influenced by the selection criteria, operator skills, judgment, and individual experience in varying techniques. There is a lack of follow-up beyond the in-hospital phase. Finally, the techniques are still in continuous evolution and newer devices and techniques have been introduced during the course of the study. The documentation of materials of three patient's data, used in the Catheter Laboratory, was not retrievable. Single wiring as an initial strategy in PCI for LAD-CTO lesions is associated with a high procedural success rate, by utilizing a wide variety of dedicated guidewires. Successful GW crossing included a 44% majority of Soft Tapered GWs, 36% Soft Non-tapered, 16% Stiff Non-tapered GWs, and 4% Stiff-tapered GWs. Case selection remains the key factor to maintain a balance among lesion complexity, procedural risk, and operator experience. 1. Stone GW, Kandzari DE, Mehran R, Colombo A, Schwartz RS, Bailey S, et al. Percutaneous recanalization of chronically occluded coronary arteries: A consensus document: Part I. Circulation 2005;112:2364-72. 2. Christofferson RD, Lehmann KG, Martin GV, Every N, Caldwell JH, Christofferson RD, et al. Effect of chronic total occlusion on treatment strategy. Am J Cardiol 2005;95:1088-91. 3. Delacretaz E, Meier B. Therapeutic strategy with total coronary artery occlusions. Am J Cardiol 1997;79:185-7. 4. Bourassa MG, Roubin GS, Detre KM, Sopko G, Krone RJ, Attabuto MJ, et al. Bypass angioplasty revascularization investigation: Patient screening, selection, and recruitment. Am J Cardiol 1995;75:3C-8C. 5. Prasad A, Rihal CS, Lennon RJ, Wiste HJ, Singh M, Holmes DR Jr. Trends in outcomes after percutaneous coronary intervention of chronic total occlusions: A 25 year experience from Mayo clinic. J Am Coll Cardiol 2007;49:1611-8. 6. Di Mario C, Werner GS, Sianos G, Galassi AR, Büttner J, Dudek D, et al. European perspective in the recanalisation of chronic total occlusions (CTO): Consensus document from the Euro CTO Club. Euro Intervention 2007;3:30-43. 7. Srivatsa SS, Edwards WD, Boos CM, Grill DE, Sangiorgi GM, Garratt KN, et al. Histologic correlates of angiographic chronic total occlusion artery occlusion: Influence of occlusion duration on neovascular channel patterns and intimal plaque composition. J Am Coll Cardiol 1997;29:955-63. 8. Godino C, Carlino M, Al-Lamee R, Colombo A. Coronary chronic total occlusion. Minerva Cardioangiol 2010;58:41-60. 9. Munce NR, Straus BH, Qi X, Weisbrod MJ, Anderson KJ, Leung G, et al. Intravascular and extravascular microvessel formation in chronic total occlusions a micro-CT imaging study. JACC Cardiovasc Imaging 2010;3:797-805. 10. Sumitsuji S, Inoue K, Ochiai M, Tsuchikane E, Ikeno F. Fundamental wire technique and current standard strategy of percutaneous intervention for chronic total occlusion With Histopathological Insights. JACC Cardiovasc Interv 2011;4:941-51. 11. Safley DM, House JA, Marso SP, Grantham JA, Rutherford BD. Improvement in survival following successful percutaneous coronary intervention of coronary chronic total occlusions: Variability by target vessel. JACC Cardiovasc Interv 2008;1:295-302. 12. Rathore S, Katoh O, Matsuo H, Terashima M, Tanaka N, Kinoshita Y, et al. Retrograde percutaneous recanalization of chronic total occlusion of the coronary arteries: Procedural outcomes and predictors of success in contemporary practice. Circ Cardiovasc Interv 2009;2:124-32. 13. García-García HM, Kukreja N, Daemen J, Tanimoto S, van Mieghem C, Gonzalo N. Contemporary treatment of patients with chronic total occlusion: Critical appraisal of different state-of-the-art techniques and devices. EuroIntervention 2007;3:188-96. 14. Morino Y, Kimura T, Hayashi Y, Muramatsu T, Ochiai M, Noguchi Y, et al. ; J-CTO Registry Investigators. In-hospital outcomes of contemporary percutaneous coronary intervention in patients with chronic total occlusion insights from the J-CTO Registry (Multicenter CTO Registry in Japan). JACC Cardiovasc Interv 2010;3:143-51. 15. Mitsudo K, Yamashita T, Asakura Y, Muramatsu T, Doi O, Shibata Y, et al. Recanalization strategy for chronic total occlusions with tapered and stiff-tip guidewire. The results of CTO New techniQUE for STandard procedure (CONQUEST) trial. J Invasive Cardiol 2008;20:571-7. 16. Katsuragawa M, Fujiwara H, Miyamae M, Sasayama S. Histologic studies in percutaneous transluminal coronary angioplasty for chronic total occlusion: Comparison of tapering and abrupt types of occlusion and short and long occluded segments. J Am Coll Cardiol 1993;21:604-11.